Episode: 909 "A 100 YEAR CELEBRATION"
100 years ago the first Chevrolet was built in Flint, Michigan and ever since there has been a love of the automobile, especially the Chevrolets. This is more than a tribute to Chevy. It is a tribute to the lifestyle, the impression it made on everyone's life and how it made many more things popular from bikes to strawberry shakes. We have collected information and web links related to the area and combined them here with photos we took and video clips from the show in what we hope will be a helpful guide as you plan your trip. Feel free to select only one or two activities per day according to your family’s interests. For assistance or for more information, call the Flint & Genesee Convention and Visitors Bureau @ (810) 600-1404 Have fun! Flint’s rich automotive history and strong ties to Chevrolet made Flint the only choice for the Vintage Chevrolet Club of America’s National Meet. 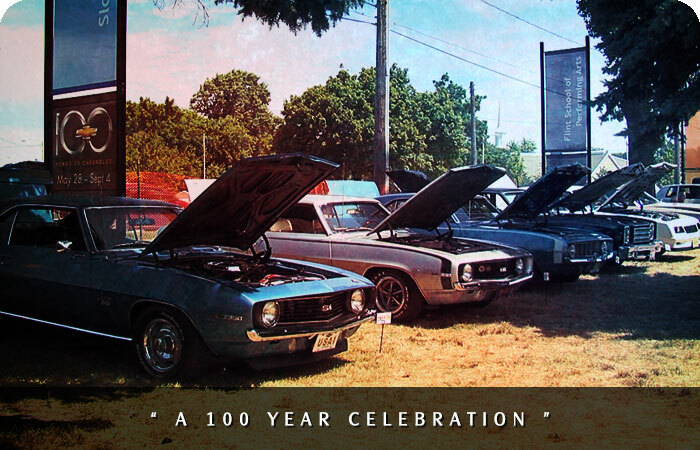 Celebrating Chevrolet’s 100th Anniversary, over 1,600 members traveled to Flint from 43 state and 7 countries. When it comes to celebrating their heritage nobody does it better than the Vehicle City home of General Motors and the United Auto Workers! When Flints holds its annual classic car show “Back to the Bricks” over 5 days every August, even the name is in honor of the streets in downtown Flint! Join two-days of fun in downtown Flint totally dedicated to motorcycles. Events include a law enforcement rodeo competition, a motorcycle show with prizes, contests, vendor and sponsor displays, motorcycle exhibit, fashion show, food, music, "After Party" sites and much more!! The 3.7 million square foot factory opened in 1947 and has assembled over 13 million cars and trucks including 300 1953 Chevrolet Corvettes. Today the plant employs 2,753 hourly and salaried employees. Arrangements for the free 2 hour guided tours can be made through the Flint & Genesee Convention and Visitors Bureau. Unfortunately the tours have just been suspended until further notice due to construction and model changeover. We expect the tours to be operational again in 2013. Car clubs, please contact Mona Murphy at mmurphy@flintandgenesee.org or (810) 600-1463. Individuals and other groups please contact Courtney Irish at cirish@flintandgenesee.org or (810) 600-1456. This memorial is dedicated to the men and women of the historic sit down strike of 1936-1937 in Flint. The marble and bronze monument depicts an actual scene from inside the plant during the strike. The monument was created by Janice Trimpe, Master Sculptor. The outdoor monument is always open to the public. Arrangements for a free guided tour that includes a short movie and period memorabilia must be arranged thru the Flint & Genesee Convention and Visitors Bureau. Car clubs, please contact Mona Murphy at mmurphy@flintandgenesee.org or (810) 600-1453. Individuals and other groups please contact Courtney Irish at cirish@flintandgenesee.org or (810) 600-1456. Hours: Summer Season Wednesday - Sunday & Holidays 10 am - 5 pm. Special Hours for Halloween & Christmas seasons. Crossroads Village is an authentic Great Lakes town from the turn of the last century, with over 34 historic structures and a thriving community to welcome you. Ride the Huckleberry Railroad, catch a show at the Colwell Opera House or learn a trade from one of our craftspeople. It’s a place out of history where you can make a little history of your own. The Warrior Dash combines the costumes of a renaissance festival with the competitive spirit of an Olympic race, plus the fun and excitement of an outdoor concert venue. Racers wear silly costumes like togas, business suits, wedding dresses, and tutus (worn by guys), and of course, viking helmets as they run through obstacles like mud pits, cargo nets and military crawls. Friends, family members, and spectators can enjoy live music, beer and food while cheering on their favorite contestants. The racers join in the celebration as they complete the course.